Wendie Holley is pictured with Mitch Smith, director of Laboratory Services, and Glen Washington, FACHE, PVH CEO. Pleasant Valley Hospital (PVH) announces the Customer Service Employee of the Month for March 2019 is Wendie Holley in the Laboratory Department. Holley has been employed since February 1990 as a Medical Laboratory Technician. Holley received a $100 check and a VIP parking space. She will also be eligible for the Customer Service Employee of the Year award with a chance for $500. 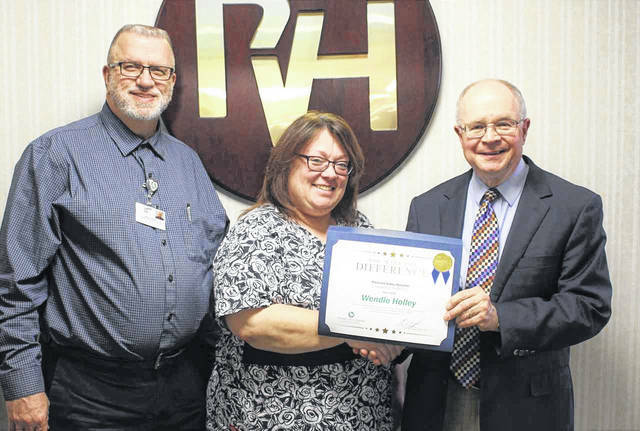 https://www.mydailyregister.com/wp-content/uploads/sites/24/2019/04/web1_4.4-Holley.jpgWendie Holley is pictured with Mitch Smith, director of Laboratory Services, and Glen Washington, FACHE, PVH CEO.